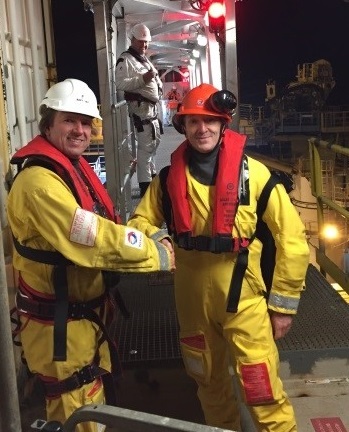 On the 6th of February 2017, the Safeway BV Seagull type motion compensated gangway on board of the M/V Aethra made its first successful people transfer at Total E&P Nederland B.V. platform L7C. 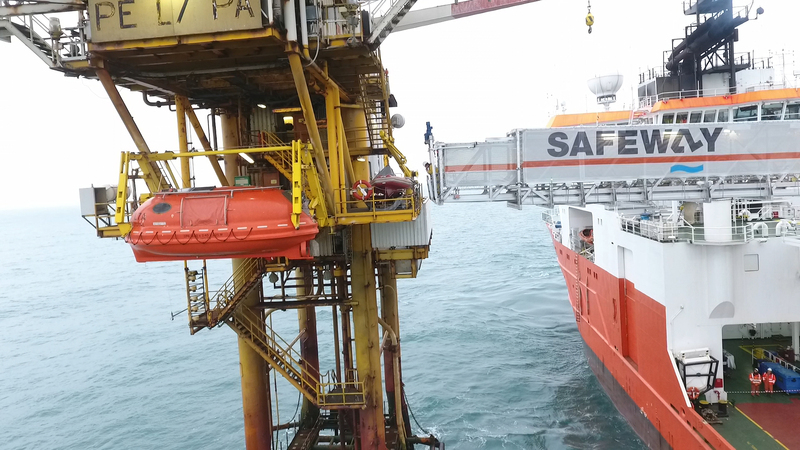 The first person crossing was Mr. Richard Serres, Total’s responsible manager for offshore maintenance. Mr. Richard Serres was excited to be the first person crossing on the Safeway system onto the L7C platform. Mr. Michael Leupen, Total E&P Nederland B.V. Marine Specialist on board mentioned the Safeway being “a masterpiece of engineering”. According to Mr. Wijnand van Aalst the first step on the L7C was just a small step for man, but a giant leap for the company Safeway. The company is now ready for the marketing of the Safeway Seagull product. Total’s logistics manager, Mr Huib Giesberts was present during the first successful transfer performed and indicated to be “impressed with the level of professionalism of the Safeway team and congratulated all for a job well done”. Total E&P Nederland B.V. is looking into marine gangway systems as a potential means of access to manned and unmanned platforms. The M/V Aethra, an SPS Certified, Norwegian built DP2 Construction Support Vessel has accommodation for up 87 people on board and can host up to 50 technicians (as Industrial Personnel or Special Persons). The Aethra is owned and operated by the Assodivers Group and remains in the Port of Den Helder ready for W2W jobs in the North Sea. Safeway and Assodivers have teamed up for the occasion where the Safeway will remain on board until further notice. Safeway's Seagull type motion compensated gangway is BV class approved and will mark the first of a next generation marine acces systems with unsurpassed workability and flexibility. Safeway will offer gangways for purchase as well as rental.